Optimal cadence. Yes or no? Cadence less 60 (i.e. less than one revolution of the pedals in a second) is bad, because it “kill your knees.” That is, if on ride up the hill and want to turn more slowly, then switch to another gear and twist quickly again. In general, I agree to it completely. I think that before consider about the optimal cadence one need to learn to ride comfortably at cadence of 60 and 80 and 90. 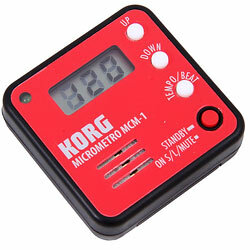 I did not want to buy special velocomp with cadence sensor, but there was a tiny metronome, which I’ve put on handlebar. First got used to 60, and then began to rise. I hoped that I would find my own rhythm. It did not happen. It was quite easy to get used to any given cadence until 90. Twist more rate was no longer comfortable may be due to the fact that riding on flat pedals. The more cadence, the smaller effort to be applied to the pedal to maintain the same speed. So it is really was a not difficult ti get used to 60-90 revolutions per minute. That changed when I moved to the force pedalling on contact (clipless) pedals in the reduced cadence. More details are set out in a separate note . When such pedalling became the habit, I come to conclusion that the maintenance itself of high cadence (80-90) need to spent force. Comfortable cadence became 73 (average on velocomp). It seems that each person has their optimum. Let’s imagine pedalling with different cadence, but with equally output power, for example, while maintaining a constant speed into a small hill. 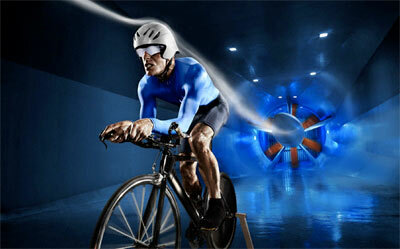 Low speed of rotation – a big efforts on the pedals, high speed – a little efforts. Rotate more faster we understand that leaving additional forces on the swinging legs while force attached to the pedals became not optimal. While slowly twist, it’s easy to control every movement, when twisted quickly, this is not impossible. That is, it is clear that there is optimum. And it much depends on the person. For one it is more easy to twist slowly but hardly, for other one – quite versa. In addition, the optimum depends heavily on how much power you need to apply. One situation is when you need to go up the hill at high speed, another one on a flat at low speed. These arguments and observations lead to absurd idea that the optimal cadence could not be associated with the numbers 60, 80, 90. 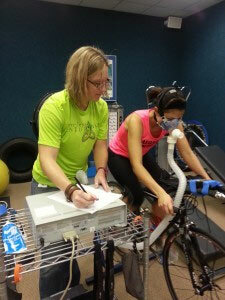 Why did these same figures applied to different people pedaling in different conditions? I think it’s all about the rhythms that are natural for humans. Let’s start with cadence 60. That means one turn the pedals in one second. Second, not only is the unit of measurement of time, but also rhythm. It is counted as a “once-and”, and the very name of “second” means “second one”. That is, rhythm of one second means consisting of two movements. 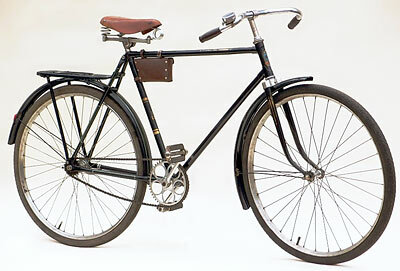 In the case of the bicycle movement with one foot down on the “one”, the movement of the second leg on the “and”. Why is it second? Most likely because this interval coincides with the pulse of a person at rest. That is, a series of two symmetrical movements covering the left and right half of the person coincides with the pulsation of blood flow. Movements with the rhythm of 1 second is, of course, not only in cycling. So people walk, doing morning exercises, etc. Why is it that cadence less then 60 kills knees? Most likely due to the fact that if you hold 60, the cyclist will reduce pedalling to walking and, therefore, will not strain knees more than during walking. And if the cadence is less than 60, the body can begin to perceive the movement as squats. It seems that the interval of 1 second is familiar to body as the basis for long-term operations without substantial loads. 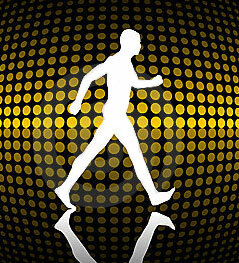 Stir with a cadence of 80 (a little more often than 60) is jogging and brisk walking. That is the motion that a person can also do long. It somehow connected optimal fluctuations in blood vessels. I’ve met several times the thesis that the legs begin to work as pumps, helping the heart to drive the blood. And the pulse in this mode is not 60, but more. So in general, if you look at people on the street, the rate of 80 / min can be seen quite often. Movement with the rhythm of the “90 minute” in the usual life I did not met. Most likely such cadence on a bicycle is just a matter of habit. If you want to give the maximum speed at lot of effort, then do not pay attention to the rhythms. A typical situation: “skedaddle his legs”. Or any sprint, for example, running the 100 meters. I am writing about this because quite common opinion that cycling is necessary to strive for the maximum possible cadence: you have to twist and quick and strong. If you do not have the strength to turn quickly at all distance, you need to train more, build up strength. It is so certain that the forums is given in the form of ready-made advice to amateurs who have a slightly different goal: how best to use the existing force. From my point of view, the problem is much deeper. 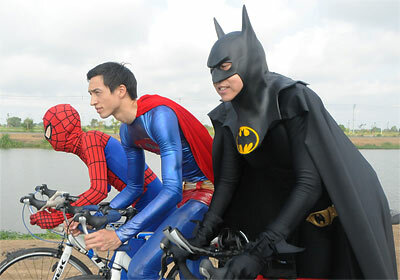 I would not advise to compare yourself to professional cyclists. One can be similar in structure to the body, not to mention the fact that sit on the same bike and wear the same clothes. And even turn with the same frequency (but with much less effort on the pedals, but we assume that it is not visible from the side). Athletes – other people, it’s genius gifted by nature and past through cruel selection. Therefore, the pursuit to the highest possible cadence, I think, should be left to them. Returning from athletes to ordinary people, need to emphasize that all people are different. Some are slow by nature, some are moving quickly. This is mainly due to the ratio of fast and slow muscle fibers, the cardiovascular system, and with the reaction rate. Therefore, despite the fact that the rhythms “60 and 80 per minute” equally familiar to any human body, some still tend to movements at a lower rate (about 60), and some usual use high (80). In network I’ve met an interesting method of finding the optimal cadence. It is necessary to choose the distance and pass it with the same speed at different cadence. And to control pulse. The best will be the cadence at which pulse is minimum. Unfortunately, I can not agree with the fact that everything is so simple. It will found the optimal cadence only for this course and only for this speed. If there is a need to ride with a much more speed, then the optimal cadence may be different. Besides it, maintaining the same speed itself does not match the optimal ride. Is it better to spend more effort (to up the pulse) while quickly fly to short hill and then stop and relax, or spend significantly less energy (low heart rate), but for a long time to ride to the hill? I think that if we talk about optimizing the physical capabilities, in the first place will not be the cadence. 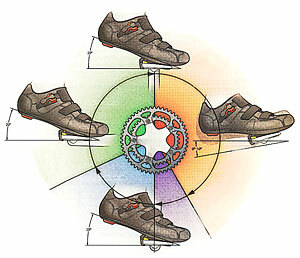 First you need to pedal with distribution of power in a circle. Also we need to try to pedal when both feet involved in each moment, while the peak force on the “pedal down” movement it is desirable to eliminate by the “smearing” it in a circle. This immediately gives the optimization of applied forces, and with a slight increase total strength of pedalling because the body (mine, for example) tuned to control peak force, and it is getting smaller. And it immediately gives the cadence at which you can control the circular rotation. Next you need to make habit of such force pedalling always. I try to calmly to the fact that cadence and effort on the pedals depend on external factors: topography, road conditions, the wind. The uphill ride is harder, slide down is easier. It’s construction of the world, no need to try fix it using the correct gear selection. The optimum cadence is elastic, it follows to waste of effort, and not vice versa. For example, you go up the hill, ride becomes heavier forces applied more while cadence falls. You pedalling quietly in a circle, without jerks, check up cadence. When cadence falls below 60, you begin to prepare to throw the transmission as soon as you finally get out of the area of ​​a circular rotation, but do not hurry to do it, especially when riding uphill over soon. Or you can stand up that is change pedalling technique for some time (but in this post this is off topic :)). If you need to speed up, you can spend more forces. It is desirable to empirically find the limi when the power could be restored then. For example, the number of uphills on a familiar course. If you take a hill at the limit of forces, it’s like switch on meter of countdown, to some hill you will not fly but creep, and and then you go slowly and sadly 🙂 But if you do not take off the limit, then to the next uphill you have time to recover. Thus, the optimal cadence could be determined as best service of pedalling in a circle with optimal force on the pedals. Optimal force on the pedals is the expenditure of maximum energy for the greatest possible speed, but one that does not run you out of steam. These efforts are highly dependent on external factors, so the cadence is not constant. On the contrary everything is quite elastic, and effort on the pedals, and cadence. This season my cadence on long distances gradually falls, while the average speed increased. Probably the my body design is aimed more for slow movements. 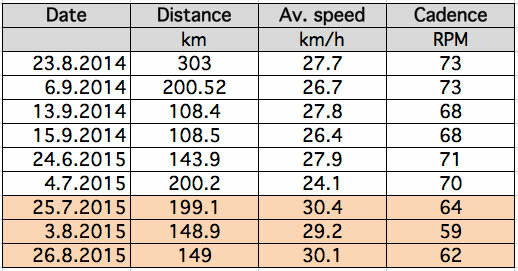 Here are the figures for the year for courses at 100+ km.